Trying to bring up a specific body part demands eating the right way! Complement your added volume, intensity, and frequency to bring up your lagging chest with these essential nutrition and supplementation must-dos! If you're really trying to bring up your chest, a run-of-the-mill workout consisting of 3 easy sets of 10 reps on bench press and a few sets of flyes isn't going to cut it. You're going to need to hit your chest from every angle, through a variety of repetition ranges to stimulate growth. And if you're going to truly push it once (or even better, twice) a week on a certain body part, then eating the same way won't cut it, either! Your nutrition and supplement choice and timing before, during, and after a workout go a long way toward pushing through a volume-heavy, intense workout, and recovering well enough to do it all over again—and soon! Here's your hour by hour breakdown of eating and supplementing to maximize muscle growth when trying to bring up your chest! Fuel: The purpose of the pre-workout meal is to ensure your fuel tank is topped off so that you have readily available energy to push through a demanding, heavy session. Failing to eat right before you train will predictably lead to a rise in what's known as your "perceived exertion." In layman's terms, everything will feel harder and heavier than it should, and you'll get less total work done than you could have. To avoid this type of letdown, I recommend that your pre-workout meal is not your first meal of the day. Even if you normally train early in the morning, if you're prioritizing chest for a few weeks, train it at lunch or in the afternoon. Not only will training later in the day enhance your strength and performance and optimize natural hormone production post-workout, you'll also have already eaten multiple meals beforehand, which means you'll have already taken in ample carbohydrates. Timing: Once you've penciled in your gym time, it's important to plan the timing of your pre-workout meal. This meal should fall 2-3 hours prior to you beginning your warm-up. The reason it should be a few hours before, versus 30-60 minutes before, is so that you have adequate time to digest the large number of calories I am about to recommend you eat. Portions: To ensure your fuel tank is well stocked, I recommend that you consume 30-40 percent of your total daily carbohydrate intake at this meal. I also recommend that you consume 25-35 grams of high-quality protein, and 1-2 servings of vegetables. Nutrient Selection: The carbohydrates you select should be high in fiber, such as oats, brown or wild rice, quinoa, and fruit. Choosing high-fiber carbohydrates will ensure that your blood glucose levels and energy remain steady between the time you eat and your warm-up. You'll find plenty of people who swear by eating fast-digesting carbs before a workout. That can be a good idea if you're eating shortly before training, but not if you eat 2-3 hours beforehand, like I think you should. On this timeline, choosing a large portion of low-fiber carbohydrates will lead to a crash in blood glucose and energy levels before you begin your warm-up. Not ideal if you need to thrive during a 60-90-minute workout. Your protein should come from a low-fat, complete protein, such as any animal protein source, soy, or quinoa. 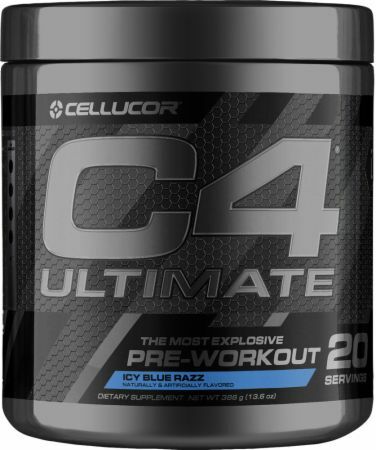 This will help to "turn on" muscle growth and repair at the cellular level one more time before you enter a period of catabolism (muscle breakdown). Your pre-workout supplement cocktail should be consumed 20-30 minutes before your warm-up. This allows the supplements to enter your blood stream and to begin exerting their benefits by the time you start your first working set. Caffeine: In short, caffeine makes the world go round. Need I say more? Caffeine is a stimulant that will enable you to push harder, lower that perceived exertion I was talking about earlier, increase your focus, and help you knock out more quality reps.[1-3] If you're not someone who normally takes a caffeinated pre-workout, the time to start doing it is when you're prioritizing certain workouts each week. Citrulline Malate: Citrulline is an amino acid that has been shown to delay fatigue. It's also a byproduct of the body's conversion of the amino acid arginine into nitric oxide. And when excess citrulline builds up, there's ultimately an increase in nitric oxide production, which enhances blood flow and nutrient delivery to your working muscles. Put another way: epic chest pump. For more information on citrulline, check out Mike Roussell's overview "Citrulline Malate: The Fatigue Fighter!" Creatine: It's not necessary to take creatine with your pre-workout concoction, but it's worth noting this is an easy time to do it. If you want to maximize growth, creatine needs to be a staple in your supplement regimen. It's the most extensively studied sports-nutrition supplement and has been shown to enhance muscle strength and muscle growth. If you want a full, round chest, then an intra-workout cocktail is a must. A well-formulated intra-workout cocktail is going to provide readily available energy, sustain optimal hydration, further increase blood flow and nutrient delivery to your working muscles, and minimize muscle protein breakdown. Yes, your pre-workout supplement may help accomplish some of the aforementioned goals, but you're going to need more to ensure all four are met. And water alone isn't going to get the job done. In fact, neither is your favorite sports drink. BCAAs are the classic, but guess what else fits the bill? Your old buddy whey. Mike Roberts, PhD, and his team in the Molecular and Applied Sciences Laboratory at the University of Auburn, have conducted preliminary research into whey protein-derived exosomes, which have a distinct and positive impact on muscle protein synthesis. His team's research suggests that whey protein may be superior to branched-chain amino acids due to a "modest and continued elevation in protein synthesis." Once this paper is published, it could be a big deal! So, what does that mean for you? As strange as it may seem as you read this, to maximize energy, hydration, and muscle recovery, consuming a whey protein may be the superior cocktail for driving muscle growth. If you're really looking to supercharge it, just add some carbs, or blend your whey with a sports drink or juice. No, this doesn't mean you need to do this during every single workout, or that I think it's the key to unlocking the world of gainz. But for your most intense, difficult, and important workout of the week, it could definitely give you a boost. The purpose of the post-workout meal is to replenish carbohydrate stores, rebuild damaged proteins and synthesize new ones, and to promote rehydration. No matter if you're in the "slam a shake right in the locker room" camp or not, your post-workout meal is crucial after big workouts. Here's how to plan it. Timing: Your post-workout meal should be consumed within 60 minutes of finishing your last set. The sooner you consume your post-workout meal, the greater the likelihood that the carbohydrates you consume head straight to your muscles. Similarly, the sooner you consume your meal, the sooner you help to flip the switch from a catabolic (muscle breakdown) to an anabolic (muscle growth) environment. Portions: Your post-workout meal should be as big, if not bigger, than your pre-workout meal. It should contain 30-40 percent of your daily carbohydrate intake, and an adequate amount of protein to maximize muscle growth and repair. For most, this is 25-35 grams of protein. However, recent research published in Physiological Reports suggests that the amount of protein necessary to maximize growth and repair may be elevated after a workout, which suggests up to 40 grams may be optimal at this time. Type of Food: Your carbohydrates should be split between a 50-50 mixture of high-fiber, slow-digesting and low-fiber, fast-digesting carbohydrates. This combination will promote rapid glycogen replenishment, but also provide you enough fiber so that you're not hungry an hour after eating. If there was ever a time for that classic bodybuilder meal of chicken, rice, and veggies, this is it! But of course, you have more options than just that. You could have a banana and a shake, some yogurt and whole grain cereal… heck, even a classic turkey sandwich could be great. Just cough up the extra 50 cents to get extra turkey! A 2013 study hurled a baseball right through the old "anabolic window," concluding that there's no specific timeline you must follow to maximize gains. If you get adequate protein in the 3-4 hours—heck, even the rest of the day—following a workout, you'll probably see the same gains. But here's the thing: It's plenty hard for many of us to eat adequate protein over the course of a day. And if slamming a shake shortly after a workout helps you remember to get that extra protein, and you still eat an hour or so later, it could be a lot worse! So what about post-workout carbs? Personally, I prefer to get them from food post-workout. Unlike during a workout, when you want to get them as quickly as possible, you have a little more leeway now. Have a handful of pretzels or a banana, and trust that it's doing what you want it to. Lockwood, C.M.a.R., M.D. Nutrition and Muscle Gains - Does Leucine Content Matter. A Point-Counterpoint Debate. In 12th Annual ISSN Conference & Expo. 2015. Austin, TX.